In this post, there are five truly amazing facts about the Texas economy. They're all recapped at the end, so don't have an anxiety attack if you miss them. Texas is the big winner in On Numbers’ midyear analysis of employment trends. Texas added 537,500 nonfarm jobs between June 2006 and June 2011, based on the latest seasonally adjusted figures from the U.S. Bureau of Labor Statistics (BLS). That’s nearly 10 times larger than the second-biggest increase by any state over the five-year span, Louisiana’s gain of 55,900 nonfarm jobs. North Dakota was third with a raw increase of 41,700. Texas added 73.4% of the nation's net new non-farm jobs since 2006, nearly ten times more than that of second place Louisiana, and more than one-hundred times the figure of barely-positive New York (the lone blue state with a net gain over the past five years). 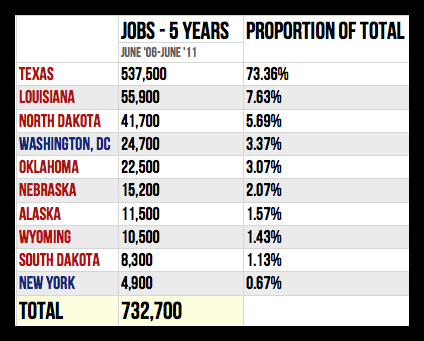 Over this same period, California lost a net 1,009,400 jobs. The most common "rebuttal," if you can call it that, from the left, is that Texas only added a bunch of minimum wage jobs, so none of the facts above really count, somehow. The problem with that argument is that Texas has outpaced the nation in wage growth, as well. Texas is also number one in new manufacturing jobs, new aerospace jobs, new energy jobs, new professional and business services jobs, new finance jobs, and new construction jobs. From June 2009 to June 2011 the state added 262,000 jobs, or half the USA's 524,000 payroll gains, according to the Federal Reserve Bank of Dallas and the Bureau of Labor Statistics. Even by a more conservative estimate that omits states with net job losses, Texas' advances make up 30% of the 1 million additions in the 34 states with net growth. Economists point to an array of factors, including high energy prices that set off an oil-drilling frenzy, rising exports and a conservative banking industry that helped the state sidestep the housing crash. Yet while energy has been a spark — employment in natural gas, oil and other mining sectors rose by 45,000, or 23%, since the recession ended — growth has been broad-based. During the past two years, professional and business services added 74,000 jobs; education and health care gained 91,000; and leisure and hospitality grew by 29,000, according to BLS. Hear that, naysayers? Texas' "growth has been broad-based." Meanwhile, Texas, already the nation's number one exporting state, saw exports rise 21% compared to 15% for the nation as a whole (which includes Texas; the gap would be larger if not for Texas being included in the national figures). Texas accounts for about 8% of the U.S. population but 16.5% of our nation's exports. Is it any wonder, then, that so many Americans are clamoring for Texas Governor Rick Perry to jump into the race for the White House and save our nation from the disaster that is Obamanomics? 1. Over the past five years, Texas has added 275% more net new jobs than all other job-adding states combined. 2. Since 2006, Texas has added well over 100 times more net new jobs than New York has added. 3. Texas is where 537,500, or 73.4%, of America's net new jobs have been created over the past five years; this figure is nearly ten times greater than the second place Louisiana (55,900, or 7.6% of America's total). 4. 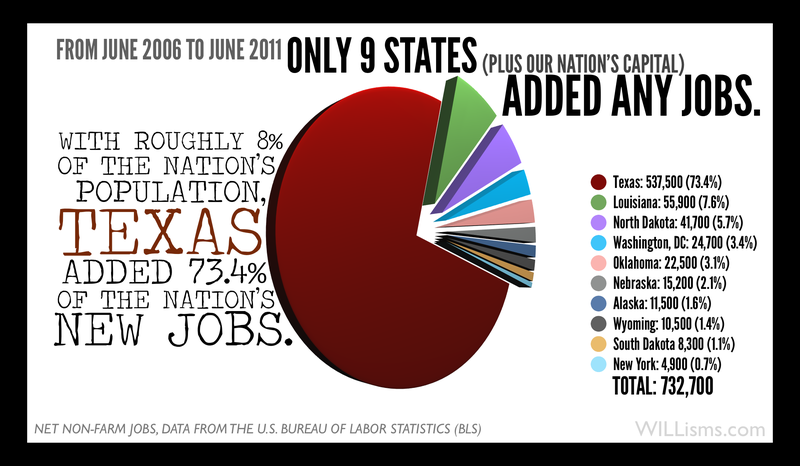 Since the recession "ended" in 2009, Texas has added exactly as many net new jobs as the rest of America combined. 5. Texas accounts for only about 8% of the nation's population but 16.5% of U.S. exports. Previous Trivia Tidbit: Texas Debt Second Lowest Per Capita In America.